To remove ledge for an abutment to allow the construction of a new bridge abutment. 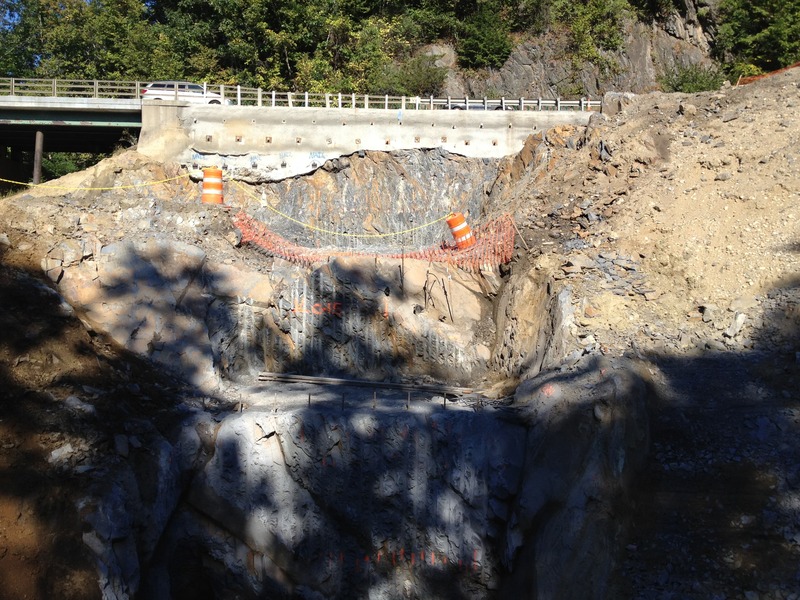 The excavation for the abutment required a stepped rock subgrade carved in the ledge as close to the active roadway as possible. The roadway was resting on 10 feet of sandy materials. This area was supported by others via a soil nail wall to the suspected top of ledge. 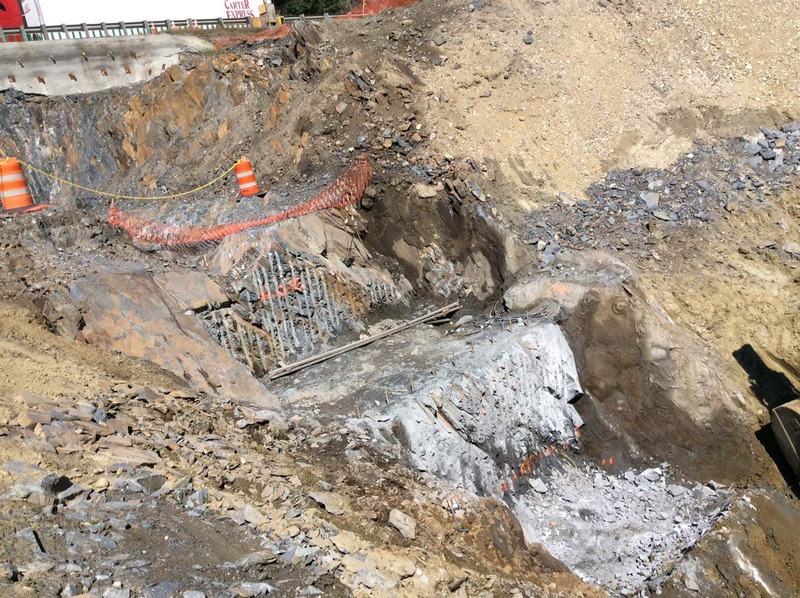 Below the top of ledge, MD&B executed a repeated sequence of vertical pre-excavation dowels, line drilling, blasting, and horizontal rock nailing for each of the 3 lifts to ensure a stable excavation. 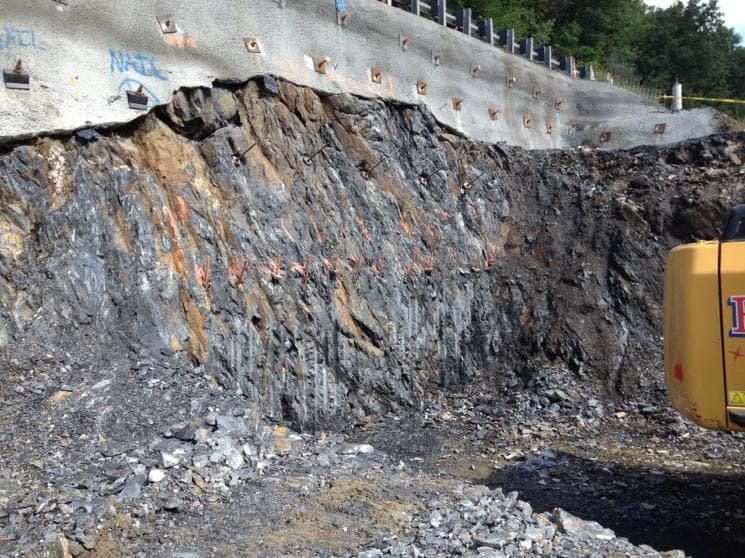 MD&B was able to head-off a potential delay on day 1, when local zones of severely weathered rock and sand lenses were encountered during the excavation below the soil nail wall. We were able to quickly react by installing a handful of hollow bar nails to complement the additional shotcrete by others, sliding smoothly into the stepped rock cuts. With good communication between the 5 Contractors and Engineers the project moved efficiently from one task to the next without delay. The group worked together in a timely manner to facilitate the complicated access and construction sequences before and during the construction. It was a pleasure working with you and your team at Brookhaven of Lexington. The leadership provided by Matt and Andy led to a successful project that was on time and on budget. My guys really enjoyed working with Hoip, Shawn, Domenic and Paul. Maine Drilling did everything they said they would and then some. Hoip was great in dealing with the abutters and your whole team was excellent at communicating with the town. We look forward to working with you again in the future."